Eliminate email infrastructure costs and management headaches with a fully managed, reliable and secure hosted email service. Zimbra is the best alternative to the expensive Exchange Server. 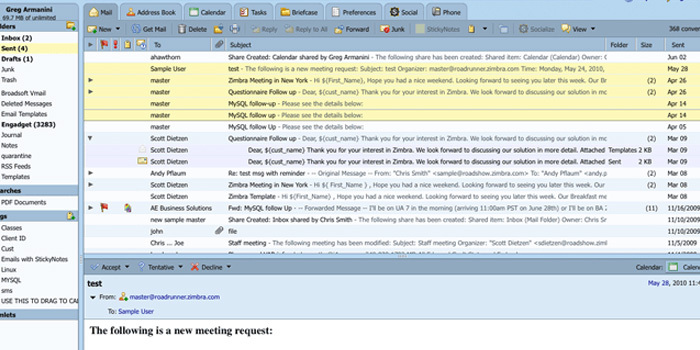 Zimbra is an enterprise-class email , calendar and collaboration solution, built for the cloud, both public and private. With a redesigned browser-based interface, Zimbra offers the most innovative messaging experience available today, connecting end users to the information and activity in their personal clouds. KeyDev's hosted email offering powered by Zimbra gives your business an enterprise class business email solution for a low monthly fee priced per server and not per user allowing you to have unlimited mailboxes, users and devices. Zimbra email gives you the power and control you need while never compromising on security. And with connectors for Outlook, iOS and Android you can use email wherever you want all synced back to the server. Zimbra constantly works in the background to ensure everything you do stays in sync. Change a phone number on your computer, it's updated on your phone. Read an email on your phone. That's updated on your tablet. Take advantage of the no cost, no obligation free trial offer on Zimbra Enterprise Email and Collaboration. To get your Free Trial started, please send us an email to sales@key-development.com. We can usually provision your service in a few hours including your DNS changes for the demo accounts.